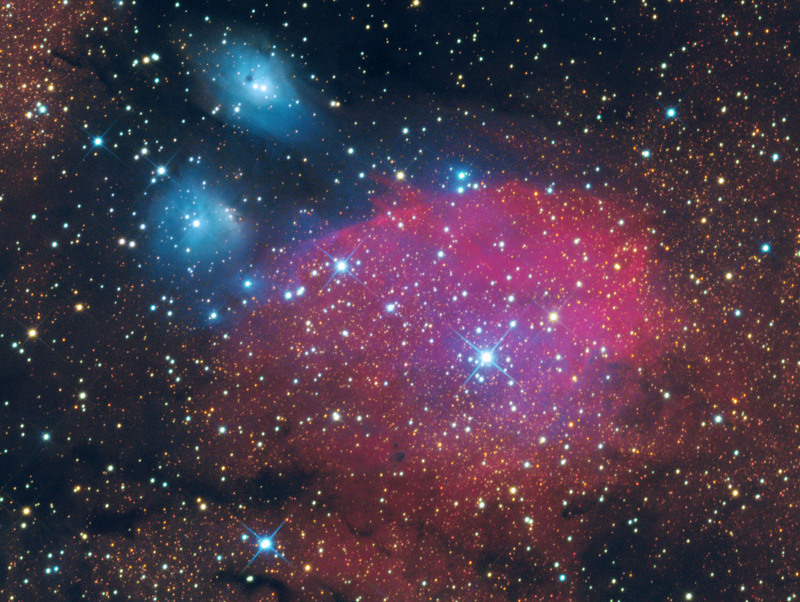 This nebula complex is located not far from the center of the galaxy. Numerous patches of dust partially obscure the light at visible wavelengths. 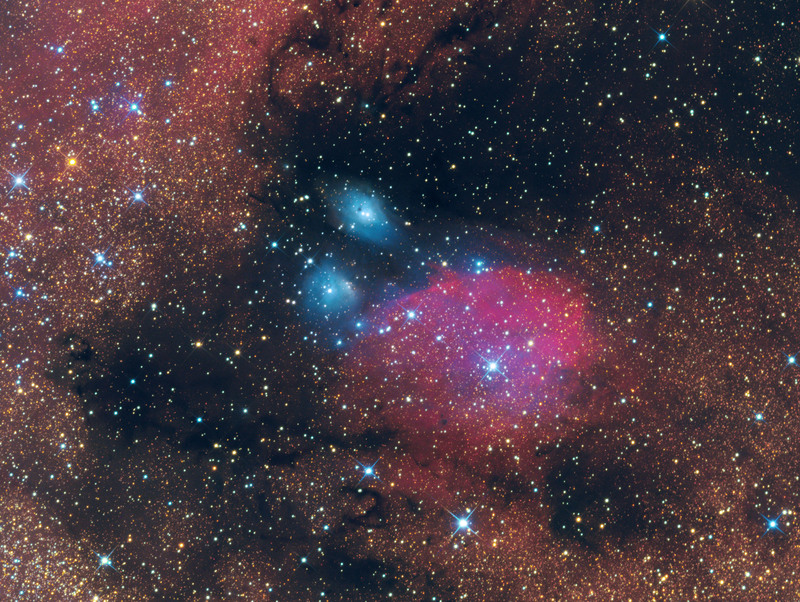 The two bright blue clouds are NGC 6589 ( = IC 4690, Ced 157a, DG 149, VDB 118, LBN 46A, Gum 78A, ESO 590-14, Magakian 757) and NGC 6590 (= IC 4700, Ced 157b, DG 150, LBN 46B, VDB 119, Magakian 758). They surround two young blue stars, by whose light they are illuminated. The diffuse magenta cloud (IC 1283 or Sh2-37) is a complex HII region which absorbs the emissions from the nearby stars and releases them in the visible red light of excited hydrogen (HII). It is not quite easy to identify the objects in this image. This is due to the fact that there is enormous confusion concerning the numbering of these objects. The online database SIMBAD, for instance, identifies the nebula Sh 2-37 at the location of NGC 6590 (?). Furthermore, there is a double NGC/IC numbers of these objects (please see the annotated map). Some astronomers consider the two bright stars are part of a loose cluster known as NGC 6595, but other believe that the existence of this cluster is quite questionable. To get an idea of this confusion, just check this webpage. Total Exposure Time - 160 min.